Bungee jumping is an adventurous activity which is performed falling down from a tall structure connecting a strong and big rope. In most of the cases, the tall structure is static object like bridge, crane or a building. However, the implication of helicopter and hot-air balloon is recently been much popular and the way of making it more audacious. The most thrilling experience occurs when one jumps down and wavers up and down because of the spring-like nature of the cord until dynamic energy dismisses.It’s heart-throbbing thrill that is guaranteed to be experienced while jumping from the high structure down to the space between two cliffs of the canyon of raging river of Bhote Koshi. The inception of the bungee jumping here in Tatopani was commenced by leading professional consultants from New Zealand, the country pioneer for the commercial development for bungee jumping. 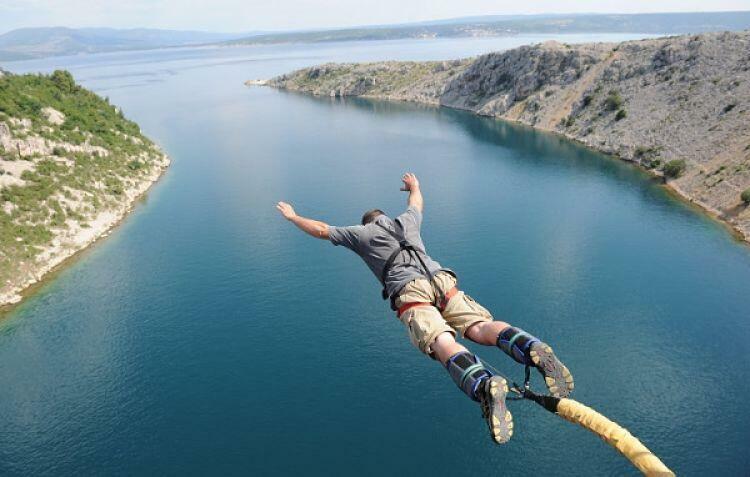 Actually, the idea of commercial development of bungee was started in New Zealand. In the very spot where the suspension bridge is erected which adjoins the two valley has been the point of awe-inspiring to check your adrenaline. Your take on will be tasted and thoroughly enjoyed as an incredible and breath-taking moment of your life which either you want to make time and again or you will chose never to try. This is indeed life-boggling adventure to be attempted. About three hours of drive from Kathmandu will take you to the area of Tibet-Nepal boarder called Tatopani where is located your adrenaline test centre which will evaluate your courage and charisma at one place as an adventure lover. The bridge measures about 166 meter width having the thick forest on the cliffs to the sides of the river with jade water flowing fiercely down in the river makes the scene dreamlike experience or may be scariest dream ever seen comes into reality here. Your journey to Tatopani is arranged for the two days of trip. The day we leave for Tatopani will also enjoy the bungee jumping on that very day. Staying overnight at the resort in this spectacular place of Himalayan country Nepal, the next can be added with more fun and frenetic exploration of rafting and rock climbing. The next destination for bungee jumping in Nepal is in Pokhara at about 20 minutes of drive from Lakeside. The bungee jumping place is established in a tower which allows you the daunting height to jump and juncture your jaw-trembling undertaking.